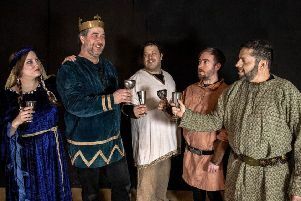 The Walberton Players’ next production is The Drunkard: Or Down With Demon Drink – and audience participation will be a big part of the fun. Performances will be on February 21, 22 and 23, with tickets available from the Walberton Players website on www.walbertonplayers.org. The piece first started life as The Drunkard; or, The Fallen Saved, an American temperance play. First performed on February 12, 1844, it was probably the most popular play in the United States for the next ten years. However, it is British writer Brian J Burton’s version that Walberton will be enjoying – a committee choice which Emily Dadson is now directing. She is enjoying the challenge: “You have got to get the actors to embrace the genre which is Victorian melodrama. “It isn’t something that is done very often so it doesn’t necessarily seem terribly natural. “You have got to get the asides, the stage whispers, the over-acting . It is not panto, but it is more akin to panto than anything else, and that is not easy for a lot of people who are would-be straight actors or more used to doing musicals. “At Walberton we like our Alan Ayckbourns and our Simon Bretts, plays of that kind, but this is something completely different. We have got to get the cast to let go, to overact and to ham it up.